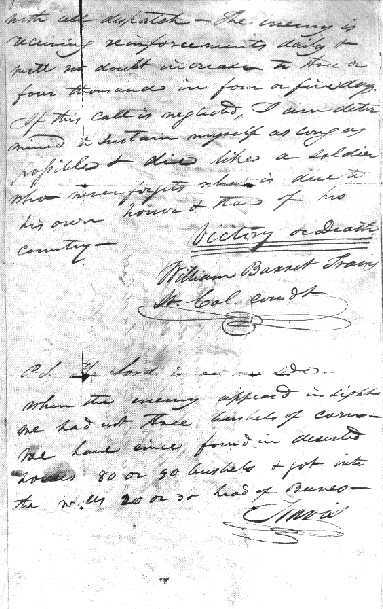 William Barret Travis and almost two hundred other defenders found themselves surrounded at the Alamo Mission in San Antonio in late February of 1836. Refusing to surrender, they held off the invading armies of Mexican Dictator Antonio Lopez de Santa Anna for almost two weeks. On March 6, the courageous Texans were overrun and slaughtered by well over 2000 Mexicans. The resulting delay of Santa Anna's eastward movement gave other Texans more time to organize, both politically and militarily, and to ultimately defeat and capture Santa Anna at the Battle of San Jacinto, fought April 21, 1836. 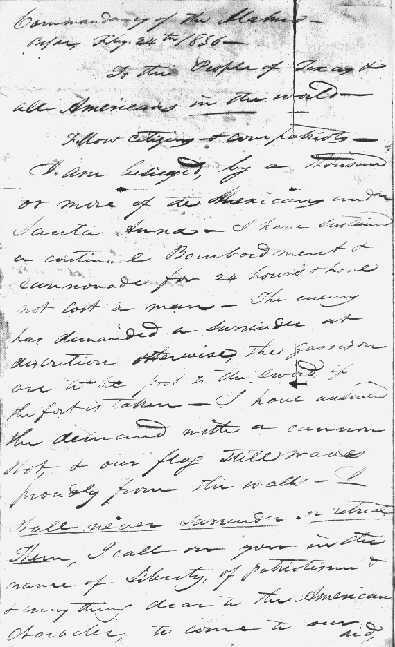 The letter below was written by Travis soon after the Mexicans first appeared in the area around San Antonio. It is often referenced as a supreme example of the virtues of courage and self-sacrifice.